Okay, I'll admit it. 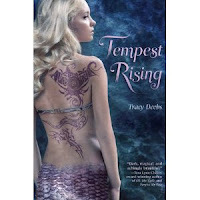 I truly expected this to be a young adult book version of The Little Mermaid. I loved The Little Mermaid, don't get me wrong, but I figured this would be perhaps a bit more serious of a retelling of that. I was very surprised with what the author did with this book. This was really a very unique story, unlike any other mermaid story I've read. Although there is a "real world" beyond the ocean and the mere people, this story read more like a fairytale than anything else. It was such a pleasant surprise. There are very few stories told today that come across with that same flare that you find in a fairytale, but this one did. Esmerine is not only a mermaid but a siren. She does not hesitate at all to bravely go to a place that both she, and her entire people, have always viewed with some wariness, even though they've found ways to co-exist with humans. Her sister disappears though, and she's willing to go off to save her. I did find it a tiny bit hard to believe that after losing one daughter, Esmerine's parents would be so quick to let her go in search of her, but it didn't really stop me from enjoying the story because Esmerine was an independent girl and had that bravery inside her character. I will admit that I expected Alandare to be a little bit more of an alpha male, but the more I read, the more I actually found the fact that he wasn't refreshing. Although she was strong, she was also vulnerable at times, and she needed him. She, in turn, brought out his protective instincts, and this is where he started to really shine for me. This was such an inventive, creative and unique story and I really enjoyed it! yay!! i just got this one, so i'm glad you liked it!